There are multiple ways to trade the signals (coloured candles). The vast majority of traders concentrate only on long signals (green candles) during uptrends and only on short signals (red candles) during downtrends. 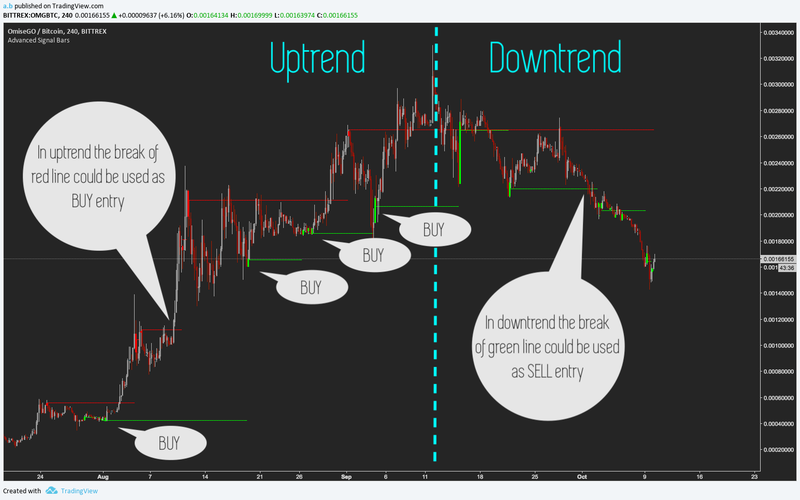 Additionally, other traders use the break of a green line during a downtrend as an entry rule and the other way around during an uptrend (see screenshot below). Of course, you can always combine the Advanced Signal Bars with additional indicators (e.g. the Levels and Zones) and adapt it to your personal strategy to make it even more profitable depending on your trading style. Learn a simple Trading Setup with our indicators.